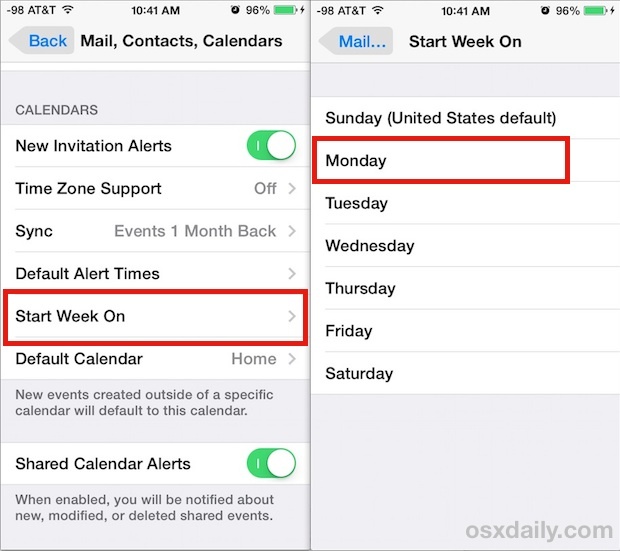 The iPhone and iPad Calendar app defaults to starting a week on Sunday, which is the generally accepted standard of most US calendars. Meanwhile, some other nations start the calendar week on Monday, and some users just prefer to start the week on the first weekday of Monday rather than the weekend of Sunday anyway. Whatever your choice, you can customize the way the iOS Calendar displays so that the week starts on a day of your choice. For the purpose of this walkthrough, we’re going to aim to start the calender week on a Monday since that is the most common alternative, but if your personal schedule calls for it, you can choose to start the week on any other day too (Tuesday, Wednesday, Friday, Saturday, whatever). This works the same in iOS on the iPhone, iPad, and iPod touch. Opening Calendar will immediately show the difference. The dates and days will shift visibly in the Calendar app to accommodate the new week start (no you don’t have a time machine with this, it’s just the displayed arrangement that is changing). This also automatically visibly shifts over holidays and events that have been set in your Calendar, but again it’s only how they are displayed to the user, it does not change the actual dates. As you can see in the screenshot, this bunches the two weekend days together at the end of the week, rather than splitting the Sunday to one end and Saturday on the other. 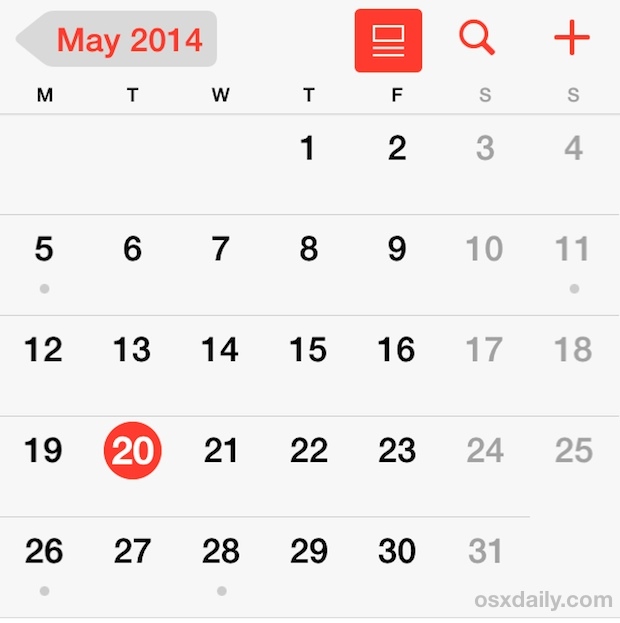 Weekends are shown in a lighter grey shade in the iOS Calendar app, making them easy to identify. 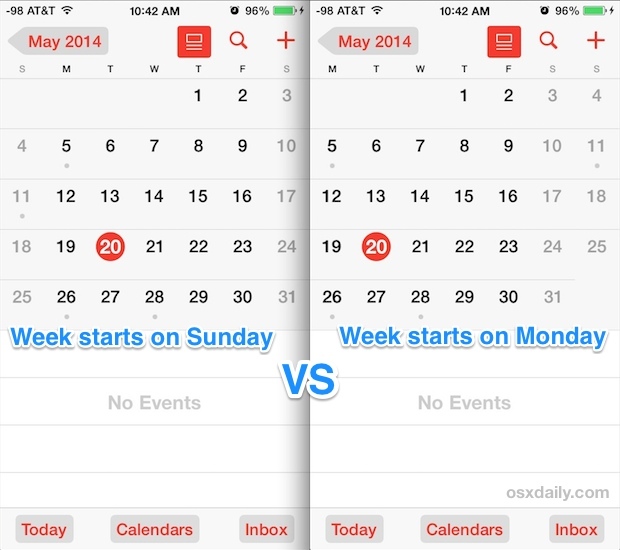 For many users with a traditional Monday-Friday work schedule, having their calendar start on Monday just makes more sense than having it start on Sunday, which is the default setting for US based iPhone, iPad, and iPod touch devies, and is fairly standard with US calendars in general. Cool I would prefer Monday too. Seems weird to split it. Pretty sure day planners start Monday right?